Stephen Leong, Hamilton Chan, Rosalie Hiah, future Director-General of the National Library of Australia, Jan Fullerton, Diana Giese, Pam Gatenby and then-Director-General Warren Horton at the launch of the Chinese Australian Oral History Partnership. 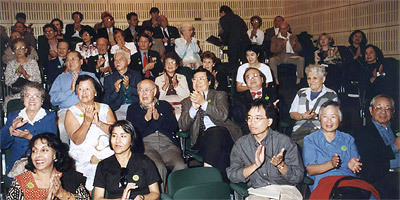 Chinese community event at the Museum of Sydney. Through interviews and related activities around the country, these projects, co-ordinated by Diana Giese, provide an overview of the diverse Chinese Australian community. The lives and times of dozens of people have been recorded. 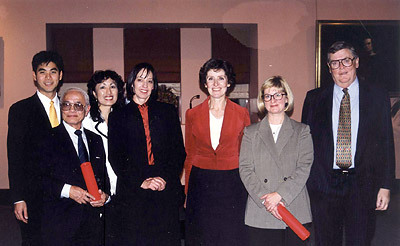 There are community elder statesmen (such as Charles See-Kee in Darwin, Eddie Liu in Brisbane, Bishop George Tung Yep in Cairns and Bo Liu in Sydney); leaders (such as members of Parliament of Chinese background, Dr John Yu, 1996 Australian of the Year and then-NSW Ombudsman Irene Moss); pioneers (such as 90-year-old Dora See Poy in Innisfail); young achievers (such as artists Ah Xian, Zhou Xiaoping and Shen Jiawei and media personality Annette Shun Wah); and migrant success stories (such as Dr Moni Lai Storz from Malaysia and Tac Tam Lam from Vietnam). The project has highlighted the interconnections between communities over time, through clan links, business ties and intermarriage, across Australia from Darwin to Melbourne, Cairns to Sydney, and back to the ancestral homeland itself. It has emphasised the continuing importance of clans and families, and interviews include several generations of some families (such as the See Poys, Lee Longs and Tongs in Cairns), and the descendants of some distinguished pioneers (such as Yuen Yet Hing’s in Darwin). It also takes in those who have married into extended Chinese families (such as Paul Campbell and Jacqui Tong). Informants have, through descriptions of their own lives, personal, professional and community achievements, helped restore Chinese contributions to Australia’s development to the mainstream historical record. Digital tapes are preserved and catalogued by the Library, and verbatim transcripts, written versions, made available to researchers. Via databases accessed online, the tapes, transcripts and summaries are available through libraries country-wide.